Looking for a place to serve? Service is a great way to get plugged in! From greeters to kids to joining an agape team, you'll find current areas of need below. If you have any questions, complete the email at the bottom of the page. Calvary Chapel's Agape Team seeks to serve those who are in need during a troublesome time. Alleviating a burden, whether great or small, in order to bring peace of mind or comfort to those we serve. 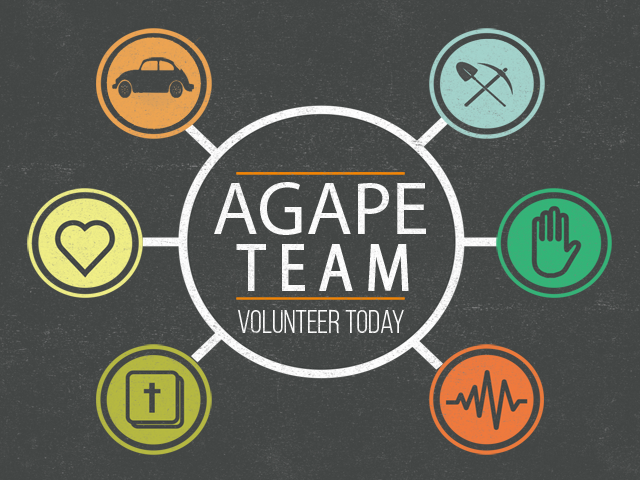 If you would like to volunteer and join the Agape Team, or if you have a need, click the corresponding button below to fill out a form. Agape Teams help with any food needs the church body may have. They may help serve funeral and memorials by laying out cookies or serving food. Agape Teams provide rides to church for people in our fellowship who don't have access to transportation that week. Agape Teams write notes of encouragement and sweet ‘thank you's’ to our church body. Cards may also be written to new believers, to welcome newcomers, those who had a baby or those in the hospital. Agape Teams provide services on an emergency basis for those faced with difficulty in their daily routine, whether recovering from a surgery or illness or the death of a family member. The Agape Teams may also be asked to go pray and fellowship with those in the body. Examples of service include: laundry, grocery shopping, light yard work, light housework and prayer/fellowship. This summer is packed at the Bar M Ranch! We need tons of volunteers from serving food at retreats to families coming to work outside. Lots of ways to get involved. 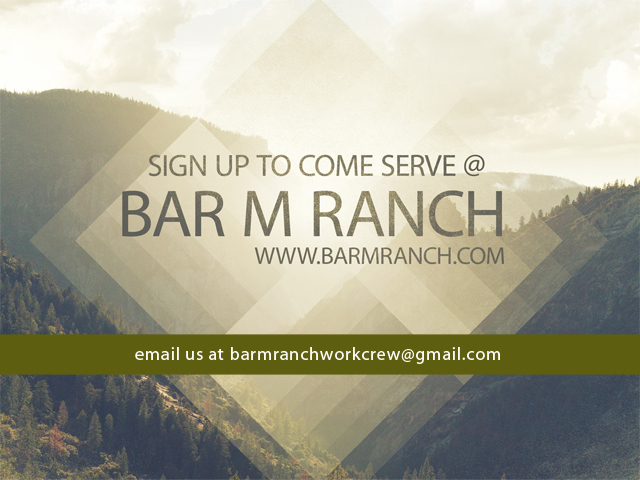 Email barmranchworkcrew@gmail.com if you want to serve at the Ranch! Thank you! The Bar M Ranch is a ministry of Calvary Chapel. The conference center, established for the purpose of glorifying God, provides a place for God’s people to grow and mature in their relationship with Him through the teaching of His Word, worship, fellowship, recreation and rest. Our ministry is to serve and bless our guests and see that all who visit leave with a greater understanding of the heart and love of God. It is our desire that those who visit our conference center will experience the presence of our Lord Jesus and leave knowing Him more intimately than before.